"Is my child eating right? ", is a concern many young parents face with their children. As kids enjoy their high activity summer break, it is important for parents to offer a complete and balanced nutrition and ensure their kids’ growth is not compromised. There's now a nutritious and tasty option to address this concern as Abbott introduces the all new PediaSure flavour, Cookies & Cream for children two years and above. PediaSure Cookies & Cream provides complete and balanced nutrition for a growing child at nutritional risk. Packed with 37 vital nutrients, it supports a child's growing height, weight and energy requirements. During summer vacation, fun takes centrestage and discipline about nutrition is often broken as children consume unhealthy foods or eat at irregular times. Two servings (morning and evening) of PediaSure go a long way towards building immunity as well as physical and brain development in children – and the new flavour is great for children who are very selective in their taste preferences. With summers in full swing, and schools closed for holidays, it is the perfect time to keep activity levels up and good health at its peak for school-going kids. At the launch event, Actress Lara Dutta, mother to a six-year-old, spoke about the importance of optimum nutrition in holistic child growth. Amal Kelshikar, Country Head & General Manager - India at Abbott Nutrition shared, “We understand how parents worry about their kids' complete nutrition and growth, particularly so in the summer break time when meal-time discipline becomes flexible and play time takes centerstage. nutritional risk. 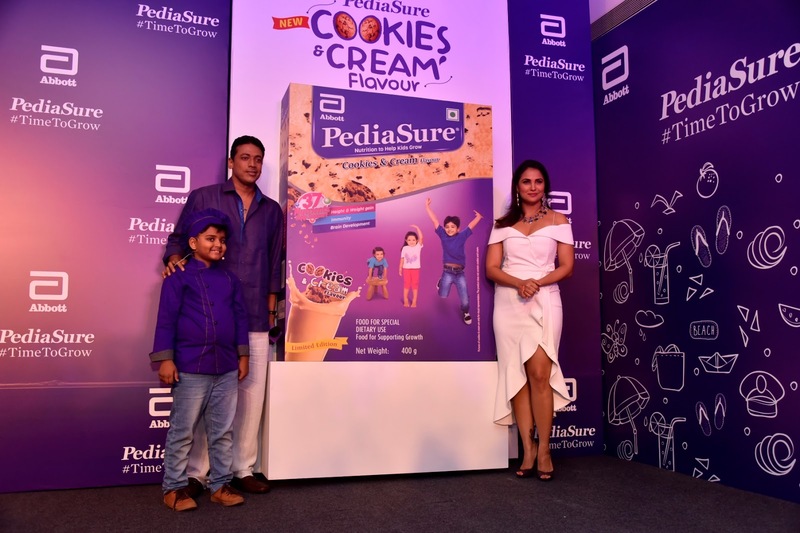 We have added to PediaSure a delicious twist, with the new Cookies & Cream flavour that will appeal to every child's palate while offering them the healthy nutrition they need." "Summer is not just a season – it’s an opportunity to refresh, relax, learn and grow, for kids. I often meet moms who come to me for advice on a balanced diet for their kids. I always recommend a lot of outdoor play, minimal screen time on television and phone, and most importantly, I tell them not to lose focus on balanced nutrition. Children’s diet should be wholesome, healthy and have the right blend of proteins, carbohydrates, fats, vitamins and minerals to support their growth and development needs,” said Dr Indu Khosla, practicing pediatrician at Cloudnine Hospital. PediaSure Cookies & Cream is available nationwide at most major retailers and online. To learn more about your child's wholesome nutrition, visit PediaSure.in OR Facwcebook.com/PediaSureIndia. Abbott, is committed to helping people live their best possible life through the power of health. For more than 125 years, they have brought new products and technologies to the world -- in nutrition, diagnostics, medical devices and branded generic pharmaceuticals -- that create more possibilities for more people at all stages of life. Today, 99,000 of them are working to help people live not just longer, but better, in more than 150 countries they serve.